We’re at a pivotal time in the world where so much is changing, from explosive growth in global populations, to advances in transportation and energy, that we need to ask ourselves, how do we keep up? The answer, we think, is simple. All of us, every man and woman whose work affects the safety of others, need to continue doing what we’ve always done – working together – but on an even higher level. We now have the analytical resources to analyze data and predict where wildfires are most likely to occur. We are committed to working with partners in the field, like Boston Fire Command, to reassess certification standards and training for hot work like welding and grinding. Our codes and standards have always been valuable to the world, but our real value is the network of passionate men and women around the world doing their jobs every day, alert to challenges that can help us all make the world safer. By being informed, we can solve challenges. By working together in real time, we can solve problems in real time, from improving ways to monitor first responder heart rates, to improving unmanned aircraft for fire suppression and search and rescue. At the end of the day, there are two things we know for certain at NFPA®. One, the world isn’t going to stop growing and advancing, and, two, only by working together with amazing men and women like yourself can we continue to help that growing, advancing world protect itself. NOTE: At this time we are able to process free print catalog requests for U.S. and Canadian customers only. If you would like an NFPA Catalog shipped internationally, please contact your local NFPA distributor. shop.nfpa.org/indhazard - NFPA 30, NFPA 350, NFPA 58, and more. 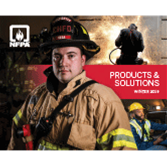 shop.nfpa.org/emergency includes comprehensive resources for fire code regulations and enforcement, compliance, disaster/emergency management, and fire protection knowledge for career advancement.